With two boys I see very little pink. Orange, yes. Brown, certainly. Blue, in profusion. Pink? Notsomuch. It’s no wonder I’ve been choosing pink yarns and fibers the last few years. My current (and only) WIP is Ice Queen from the Winter 07 Knitty. I’m doing the 60 bead version, instead of the insane 300 bead one. I picked up the beads from the Twisted Sisters booth at Stitches back in October, without having the yarn on hand. 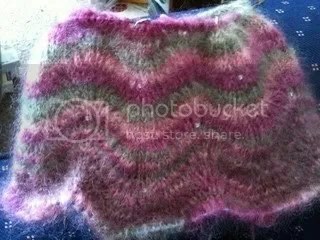 I’m pretty happy with the way the pink foil-y insides work with the yarn. 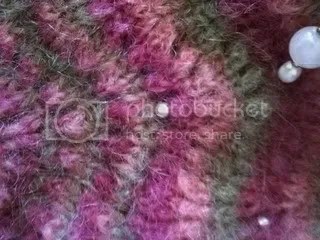 The yarn is Jo Sharp Rare Comfort Infusion Kid Mohair in #617 Rosehip (I’m pretty sure.) I’m fascinated with watching the stripes appear, as I never expected that to happen. The three colors are about 18-20″ long each (23-26 stitches?) so they may lay just right with the gauge to make happy little stripes. It IS mohair, though, which renders it utterly evil, regardless of it’s looks. I, of course, forgot that mohair will only frog if frozen first, and cursed it mightily during a failed cast on. We’ve mended our ways since, and seem to be getting on nicely. A bit of detail. The beads in the top corner are my stitch markers, not part of the knitting. Yes, it IS an early spring and too warm already for cowls and neckwarmers, especially when the recipient lives in Florida. That is the way of knitting, isn’t it?